Just in time for St Patrick’s Day is this mouth-watering White Chocolate Bark recipe. 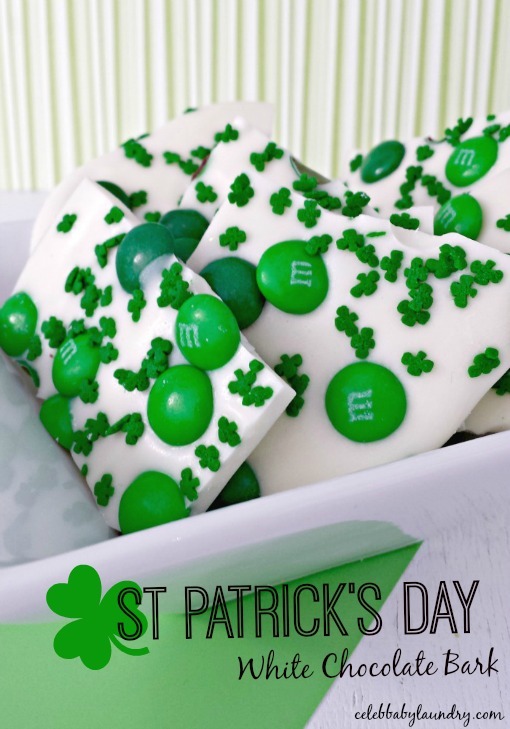 Complete with green M&M’s and Shamrock Confetti Sprinkles these St Patrick’s Day bark pieces are sure to be the perfect accompaniment to any party. Children will also love taking the chocolate bark pieces to gift at school. Add the candy melts to a small bowl and microwave according to the instructions on the package. Once the candy melts are smooth, spread it out on the parchment paper so that it is about 1/4-1/2 inch thick. Add the sprinkles to the top of the chocolate. Refrigerate until the chocolate is hard – at least 1 hour. Break the chocolate into pieces with your hands (some of the topping will fall off, but that’s ok). Package into festive containers or bags.